Users. 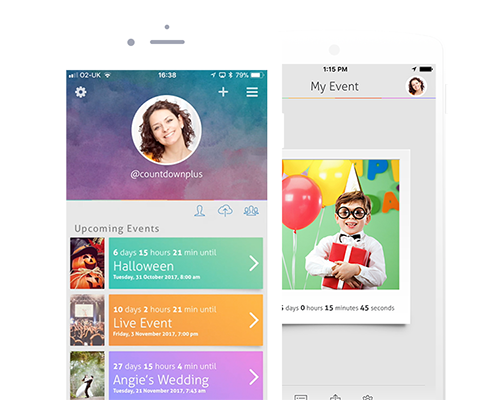 The Services allow registered users that create and share Countdowns to Events to access certain features, functionality, information and services provided by us and/or our affiliates, which may include the ability to access personalized information and content regarding certain events, such as notifications and recommendations regarding birthdays, live concerts, trips and vacations, goals and achievements, events, tickets, movies and shows, school events and other related products and services. In order to access and use certain content, features and functionality of the Services, whether as a Visitor or a User, we may require that you (a) register for the applicable Services, whether on the Site, a Third Party Platform or otherwise, including, in some instances, creating and/or providing a username and password combination (“User Credentials”) and (b) provide to us and/or make available (e.g., via Third Party Platform permissions and consents, etc.) certain additional information, which may include your email address, legal name, country of residence, location, date of birth, and other preferences, usage data, and for fee-based transactions and purchases offered by us, your physical address, telephone number(s), applicable payment information (e.g., payment card data, PayPal information, etc. ), and other information (collectively, a “User Account”). You represent and warrant that all registration and account information you submit and/or make available is truthful and accurate and you shall maintain and promptly update the accuracy of such information. Further, if you elect to become a registered user of the Services, you are responsible for maintaining the confidentiality of your User Credentials, and you shall be responsible and liable for any access to or use of the Services by you or any person or entity using your User Credentials, whether or not such access or use has been authorized by you or on your behalf, including any Fee-Based Services (as hereafter defined). You agree to immediately notify Apps Beyond of any unauthorized use of your User Credentials or User Account, or any other breach of security. It is your sole responsibility to (a) control the dissemination and use of your User Credentials and User Account, (b) update, maintain and control access to your User Credentials and User Account, and (c) cancel your User Account on the Services. Apps Beyond shall not be responsible or liable for any loss or damage arising from your failure to comply with this Section 4. We require users to respect our copyrights, trademarks, and other intellectual property rights, and likewise respect the intellectual property of others. Content contained and/or made available through the Services (excluding User Postings, as defined below), including all Image Packs Content, platform supplied event and ticket content, artwork, photographs, graphics, logos, trademarks, copy, text, computer code, software, music (including the musical compositions therein), information, materials and/or other intellectual property and/or proprietary rights therein (“Content”), may be owned, controlled and/or licensed by Apps Beyond, Artists or other third parties. The Content may be protected by copyright, trademark and other applicable proprietary rights laws, including under U.S. Federal and State, as well as applicable foreign laws, rules, regulations and treaties. You must not alter, delete or conceal any copyright, trademark, service mark or other notices, including any notices of attribution, contained on or incorporated in the Services, including notices on any Content you transmit, download, display, print, stream or reproduce from the Services. Except as permitted in connection with the User/Subscriber Services, all other Services are to be used solely for your non-exclusive, non-assignable, non-transferable, non-commercial and limited personal use and for no other purposes. You shall not, nor shall you allow any third party to, reproduce, modify, create derivative works from, display, perform, publish, distribute, disseminate, broadcast or circulate to any third party (including on or via a third party website or platform), or otherwise use, any Content (a) without the express, prior written consent of the respective owners, or (b) in any way that violates the rights of any third party. If you believe that the Services contain elements that infringe your copyrights in your work, please follow the procedures set forth in Section 9 below. Apps Beyond assumes no responsibility for removing, or monitoring the Services for, any inappropriate, false, incorrect, misleading, deceptive or unlawful content, information, materials or conduct. Apps Beyond reserves the right to investigate and take appropriate action against anyone who, in Apps Beyond’s sole discretion, violates, or is suspected of violating, this Agreement, including removing any Content or User Posting from the Services at any time, and/or reporting you to law enforcement authorities. The Services may provide you and other users with an opportunity to submit, post, email, display, transmit or otherwise make available events, comments, reviews, links, materials, ideas, images, opinions, messages and other content and information via the Services (each, a “User Posting”, and collectively, “User Postings”). When you submit User Postings, you may also be asked to provide information about you and your submission. This may include such things as your User Credentials, information about the User Posting, your location, activity, preferences, photographs, media and/or similar information. You acknowledge and agree that all User Postings made by means of or in connection with any portion of the Services are public and that (a) you have no expectation of privacy in any User Posting, including any photograph or post that is configured with public information, or associated with a particular group that you're a member of, and (b) no confidential, fiduciary, contractually implied or other relationship is created between you and Apps Beyond by reason of your transmitting a User Posting to any area of or in connection with the Services. Further, you understand that by using the Services, you may be exposed to other people’s User Postings that could be offensive, incorrect, indecent or objectionable and, as such, Apps Beyond does not guarantee the accuracy, integrity, quality or content of any User Postings. Under no circumstances shall Apps Beyond be liable in any way for any loss or damage of any kind incurred as a result of any User Postings submitted, uploaded, posted, emailed, displayed, transmitted or otherwise made available. In connection with all User Postings you submit, post, email, display, transmit or otherwise make available, you grant to Apps Beyond the unrestricted, worldwide, non-exclusive, irrevocable, perpetual, fully paid-up and royalty-free right and license, in any form or format, on or through any media or medium and with any technology or Devices now known or hereafter developed, to use, host, cache, store, maintain, use, reproduce, distribute, display, exhibit, perform, publish, broadcast, transmit, modify, prepare derivative works of, adapt, reformat, translate, and otherwise exploit all or any portion of your User Posting on the Services and in connection with any of Apps Beyond businesses (including its successors and assigns), including for promotional purposes (e.g., Promote your event as "Countdown of the week" on social media, all associated websites, and mobile apps etc.). For clarity, only DMCA notices should be sent to the Designated Agent and any other feedback, comments, requests for technical support, and other communications should be directed to Countdown+ customer service by sending an email to [email protected] You acknowledge and agree that if you fail to comply with all of the requirements of this Section 9, your DMCA notice may not be valid. We may make available certain fee-based content and other e-commerce services on and/or in connection with the Services or through third party service providers (“Fee-Based Services”). For example, you may be able to purchase event tickets and songs, or order certain music-related products and/or licenses through the Services or third party service providers, including additional Services features and functionality. You acknowledge and agree that certain Fee-Based Services may utilize third party service providers (e.g., Apple, Google, Ticketmaster etc. ), and all purchases made through these third party service providers are subject to their respective terms and conditions, and in the event of a conflict between such third party’s terms and conditions and this Agreement, the terms and conditions of the third party service provider shall govern and control. Apps Beyond is not responsible and has no liability whatsoever for goods or services you obtain through our third party service providers or other web sites or web pages. We encourage you to make whatever investigation you feel necessary or appropriate before proceeding with any online transaction with any of these third parties. You may only use the Fee-Based Services if, and you hereby represent, warrant and agree that, (a) you are 18 years of age or older and (b) you shall pay in full the prices and fees (including all applicable taxes) for any purchases you, or anyone using the User Account registered to you, make via PayPal, credit, debit or charge card or other payment means then acceptable to Apps Beyond concurrent with your order. Certain payment means acceptable to Apps Beyond may be subject to certain additional restrictions and conditions, including territory restrictions, bank/payment card restrictions, spending limits, third party service provider restrictions or otherwise, which may prevent the processing of your order. If a transaction has been declined online due to payment card or other payment service issues, please ensure all data is correct and resubmit. If the transaction is not accepted, you will be unable to use that card or payment method for your transaction and should use another card or payment method acceptable to Apps Beyond and/or third party services providers, as applicable. Apps Beyond or any of its third party service providers does not guarantee that product descriptions or other content will be accurate, complete, reliable, current, or error-free. Descriptions and images of, and references to, products on the Services do not imply our or any of our affiliates' endorsement of such products. Apps Beyond and its third party operational service providers reserve the right, with or without prior notice, (i) to change the product descriptions, images, and references, (ii) to limit the available quantity of any product, (iii) to honor, or impose conditions on the honoring of, any coupon, coupon code, promotional code or other similar promotions, (iv) to bar any user from conducting any or all transaction(s) and (v) and/or to refuse to provide any user with any product. Prices and availability of any product and/or service are subject to change without notice. Certain Apps Beyond Apps and other Services require data access, and the provider of data access (e.g., network operator, wireless carrier, etc.) for your Device may charge you data access fees in connection with your use of such Apps Beyond Apps and other Services, including wireless carrier messaging and other communication, messaging and data fees and charges. Under no circumstances will Apps Beyond be responsible for any such data access fees and charges in connection with your use of any Apps Beyond Apps or other Services, including wireless internet, email, text messaging or other charges or fees incurred by you (or any person that has access to your Device, telephone number, email address, User Account or other similar information). Further, the use or availability of certain Apps Beyond Apps and other Services may be prohibited or restricted by your wireless carrier and/or data access provider, and not all Apps Beyond Apps and other Services may work with all wireless carriers, networks, platforms, services or Devices. From time to time, Apps Beyond, or the Services’ operational service providers, suppliers, partners, and Advertisers may conduct promotions and other activities on, through or in connection with the Services, including contests and sweepstakes (collectively, “Promotions”). Each Promotion may have Additional Terms and/or Rules which shall be posted or otherwise made available to you in connection therewith. To the extent that a User offers any Promotions on or through the Services, User agrees to abide by the terms and conditions of the applicable Third Party Platforms and to indemnify Apps Beyond for any claims in connection with its offering of such Promotions in accordance with Section 17 below. This Agreement, and any rights, licenses and privileges granted herein, may not be transferred or assigned by you, but may be assigned or transferred by Apps Beyond without restriction, notice or other obligation to you. You agree to indemnify, defend and hold Apps Beyond, its affiliates, and parent company, and their respective successors and assigns, directors, officers, employees, representatives, agents, licensors, Advertisers, partners, suppliers and service providers harmless from any and all claims, liabilities, damages, losses, costs and expenses (including reasonable attorneys’ fees), arising in any way out of or in connection with (a) your breach or violation this Agreement or any applicable law, (b) any third party claims regarding your use of the Services, including the Manager/Analytics Services, and/or (b) your User Postings. Apps Beyond reserves the right to assume the exclusive defense and control of any matter subject to indemnification by you and all negotiations for its settlement or compromise, and you agree to fully cooperate with us upon our request. THE SERVICES, AND ALL CONTENT, PRODUCTS, SERVICES AND USER POSTINGS MADE AVAILABLE ON, THROUGH OR IN CONNECTION THEREWITH, ARE PROVIDED ON AN “AS IS” AND “AS AVAILABLE” BASIS, WITHOUT ANY REPRESENTATION, WARRANTY OR CONDITION OF ANY KIND, EXPRESS OR IMPLIED, OR ANY GUARANTY OR ASSURANCE THE SERVICES WILL BE AVAILABLE FOR USE, OR THAT ANY PRODUCTS, FEATURES, FUNCTIONS, SERVICES OR OPERATIONS WILL BE AVAILABLE OR PERFORM AS DESCRIBED. ALL IMPLIED REPRESENTATIONS, WARRANTIES AND CONDITIONS RELATING TO THE SERVICES, AND ALL CONTENT, PRODUCTS, SERVICES AND USER POSTINGS ARE HEREBY DISCLAIMED. WITHOUT LIMITING THE FOREGOING, WE ARE NOT RESPONSIBLE OR LIABLE FOR ANY MALICIOUS CODE, DELAYS, INACCURACIES, ERRORS, OR OMISSIONS ARISING OUT OF YOUR USE OF THE SERVICES. YOU UNDERSTAND, ACKNOWLEDGE AND AGREE THAT YOU ARE ASSUMING THE ENTIRE RISK AS TO THE QUALITY, ACCURACY, PERFORMANCE, TIMELINESS, ADEQUACY, COMPLETENESS, CORRECTNESS, AUTHENTICITY, SECURITY AND VALIDITY OF ANY AND ALL FEATURES AND FUNCTIONS OF THE SERVICES, INCLUDING USER POSTINGS AND CONTENT ASSOCIATED WITH YOUR USE OF THE SERVICES. FURTHER, WITHOUT LIMITING THE FOREGOING, APPS BEYOND, ITS AFFILIATES, PARENT COMPANY, SUCCESSORS AND ASSIGNS, OFFICERS, DIRECTORS, EMPLOYEES, AGENTS, REPRESENTATIVES, LICENSORS, PARTNERS, SERVICE PROVIDERS, ADVERTISERS AND SUPPLIERS MAKE NO REPRESENTATION, WARRANTY OR CONDITION OF ANY KIND, EXPRESS OR IMPLIED, REGARDING ANY PRODUCTS OR SERVICES ORDERED OR PROVIDED VIA THE SERVICES, AND HEREBY DISCLAIM, AND YOU HEREBY WAIVE, ANY AND ALL REPRESENTATIONS, WARRANTIES AND CONDITIONS OF ANY KIND, EXPRESS OR IMPLIED, MADE IN CONNECTION WITH PRODUCT OR SERVICES LITERATURE, FREQUENTLY ASKED QUESTIONS DOCUMENTS, ADVICE OR INFORMATION, WHETHER ORAL OR WRITTEN, OBTAINED BY YOU IN CONNECTION WITH THE SERVICES, INCLUDING CORRESPONDENCE WITH COMPANY OR ITS AGENTS OR OTHERWISE. YOU UNDERSTAND AND AGREE THAT, TO THE FULLEST EXTENT PERMISSIBLE BY LAW, APPS BEYOND, ITS AFFILIATES, PARENT COMPANY, SUCCESSORS AND ASSIGNS, OFFICERS, DIRECTORS, EMPLOYEES, AGENTS, REPRESENTATIVES, LICENSORS, PARTNERS, SERVICE PROVIDERS, ADVERTISERS AND SUPPLIERS, SHALL NOT BE LIABLE FOR ANY LOSS OR DAMAGE, OF ANY KIND, DIRECT OR INDIRECT, IN CONNECTION WITH OR ARISING FROM USE OF THE SERVICES OR FROM THIS AGREEMENT, INCLUDING COMPENSATORY, CONSEQUENTIAL, INCIDENTAL, INDIRECT, SPECIAL OR PUNITIVE DAMAGES. This Agreement and your use of the Services is governed by, construed and enforced in accordance with the internal substantive laws of the State of Texas (notwithstanding the state's conflict of laws provisions) applicable to contracts made, executed and wholly performed in Texas, and, for the purposes of any and all legal or equitable actions, you specifically agree and submit to the exclusive jurisdiction and venue of the State and Federal Courts situated in the State and County of Texas and agree you shall not object to such jurisdiction or venue on the grounds of lack of personal jurisdiction, forum non conveniens or otherwise. TO THE EXTENT ALLOWED BY LAW, EACH OF YOU AND APPS BEYOND WAIVE ANY RIGHT TO PURSUE DISPUTES ON A CLASSWIDE BASIS; THAT IS, TO EITHER JOIN A CLAIM WITH THE CLAIM OF ANY OTHER PERSON OR ENTITY, OR ASSERT A CLAIM IN A REPRESENTATIVE CAPACITY ON BEHALF OF ANYONE ELSE IN ANY LAWSUIT, ARBITRATION OR OTHER PROCEEDING. This Agreement contains the entire understanding and agreement between you and Apps Beyond concerning the Services and supersedes any and all prior or inconsistent understandings relating to the Services and your use thereof. This Agreement cannot be changed orally. If any provision of this Agreement is held to be illegal, invalid or unenforceable, this shall not affect any other provisions and this Agreement shall be deemed amended to the extent necessary to make it legal, valid and enforceable. The terms “include,” “includes,” and “including,” whether or not capitalized, mean “include, but are not limited to,” “includes, but is not limited to,” and “including, but not limited to,” respectively and are to be construed as inclusive, not exclusive. Any provision which must survive in order to allow us to enforce its meaning shall survive the termination of this Agreement; however, no action arising out of this Agreement or your use of the Services, regardless of form or the basis of the claim, may be brought by you more than one year after the cause of action has arisen (or if multiple causes, from the date the first such cause arose). The failure of Apps Beyond to exercise or enforce any right or provision of this Agreement will not operate as a waiver of such right or provision. The Services are controlled by Apps Beyond from its offices in the U.S. Apps Beyond makes no representation or warranty that the Services or Content contained on or made available in connection therewith is legal, appropriate or available for use in other locations. Those who choose to access the Services from other locations do so at their own risk and are responsible for compliance with any and all local laws, rules and regulation, if and to the extent local laws, rules and regulations are applicable. No software made available in connection with the Services may be downloaded, exported or re-exported into (or to a national or resident of) any countries that are subject to U.S. export restrictions. We reserve the right to terminate or deny access, use and registration privileges to any user of the Services at any time, for any or no reason, with or without prior notice, and without obligation to you or any third party. You acknowledge, consent and agree that Apps Beyond may access and disclose your account and registration information if required to do so by law or if based on a good faith belief that such access or disclosure is necessary to comply with the legal process, enforce the Agreement, response to claims that any content or information violates the rights to any third party, respond to customer service requests, or otherwise protect the rights, property or safety of Apps Beyond, its users or third parties. The trademarks, logos, service marks and trade names (collectively, the “Trademarks”) displayed on or in connection with the Services are registered and unregistered Trademarks of Apps Beyond, its affiliates and others and may not be used in connection with products and/or services that are not related to, associated with, or sponsored by their rights holders that are likely to cause customer confusion, or in any manner that disparages or discredits their rights holders. Nothing contained on or in connection with the Services should be construed as granting, by implication, estoppel, or otherwise, any license or right to use any Trademark displayed on or in connection with the Services without the written permission of Apps Beyond or the third party that may own the applicable Trademark.